Inventory We are a resale marketplace, not a box office or venue. Ticket prices may exceed face value. This site is not owned by Red Bull Arena . The Red Bull Arena opened in 2010, then named Red Bull Park, as the home to Major League Soccer's New York Red Bulls. 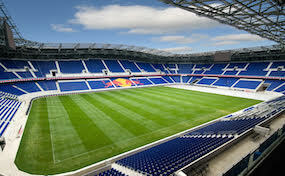 The Red Bull Arena box office is located at 600 Cape May Street in Harrison New Jersey. The stadium was built for $200 million and has a seating capacity of 25,000. Red Bull Arena tickets have hosted some of the biggest International clubs and teams from Mexico, Bayern Munich, Columbia, Manchester United, Paris Saint-Germain, and many more. RedBull.ArenaHarrison.com is an independently owned and operated site the deals solely in the online resale secondary ticket market. We are not associated or affiliated with any venue, official website, box office, or supplier. Prices on our sites tend to be above face value and can change quickly with demand. To order tickets for all Red Bull Arena Harrison events please follow the steps online through the checkout or pick up the phone and call our operators at anytime.